Raising a teenage daughter has always been hard enough. Now you need to raise one in the digital age. That means dealing with the likes of social media, text messaging, and cyber bullying. Just how do you do it? Here are five parenting tips to raise your teenage daughter and keep her safe and happy. Having rules in place will really help keeping your daughter safe. This needs to be for all forms of technology, and should be applied to you as well as your daughter. It could be something like you want to know when your daughter has created a new account on a site, so you can see the profile when or if there is a problem. However, you have to promise that you won’t snoop and will only need to know as a matter of security. Teenagers want some independence, but they are still too young to go out on their own. There are plenty of hidden dangers when it comes to social media and technology. One of the rules could be that she comes to you when there is something worrying on a platform. Plenty of girls are threatened and feel like they will get in more trouble for being on an disallowed site. However, you need to make it clear that her safety is more important. There’s no point banning all technology from the home. This isn’t realistic and will just set your daughter up for trouble later in life. Instead, you want to encourage moderation. This can mean putting the phone down before coming to the dinner table and encouraging periods of the day without any technology. Lead by example. Spend some time with the family rather than being glued to your phone. Step away from the computer and pull out a book to read instead when you’re having some quiet time. Teenage girls tend to be more in danger with technology than teenage boys. It’s important to discuss the dangers associated with social media and cell phones. This isn’t just about potential predators, but also about cyber bullying and trolling. Your daughter may be bullied through social media. It is worth discussing how to act when something like that happens. Talk about blocking individuals, not responding to trolling and being courteous to others when commenting. Too many girls focus so much on the number of likes and shares their social media posts get that they are always in competition with each other. 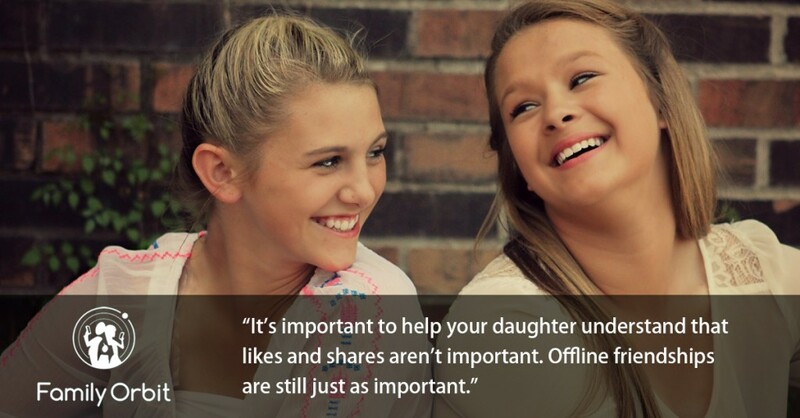 It’s important to help your daughter understand that likes and shares aren’t important. Offline friendships are still just as important. Teenage girls need to understand the self-worth is important, too. They need to find that outside of technology, and you can help them do that. By focusing more on self-worth, they will be happier individuals and that will help them in the future. This is a big lesson to teach teenage girls. Just because someone says something or a story is reported, it doesn’t make it true. Rumors spread and the internet lies. You can help teach this lesson through example. When you read something, do your diligence to check for sources to back it up. Find out if something is true or if rumors have started based on one thing that was said. Look out for hearsay and things being taken out of context. As your teenage daughter sees you doing this, she is more likely to follow by example. Keeping your daughter safe in a world of technology is harder than before it was invented. There are new dangers, including cyber bullying and predators. Children need to be wary and the above tips can help you keep your teenage daughter safe.